Barbour is not quite the level of craft or quality that we normally feature on Permanent Style. However, rather like US brand Filson that we covered recently, they deserve mention for the beautiful way they age and their commitment to service and repair. Myself, photographer Horst Friedrichs and designer Toby Egelnick visited the Barbour facility in South Shields last week. It is three large buildings, a couple of minutes from the yawning mouth of the Tyne river, whose deep port was hugely popular in the nineteenth century – Barbour made its name kitting out workers, sailors and stevedores around that port. 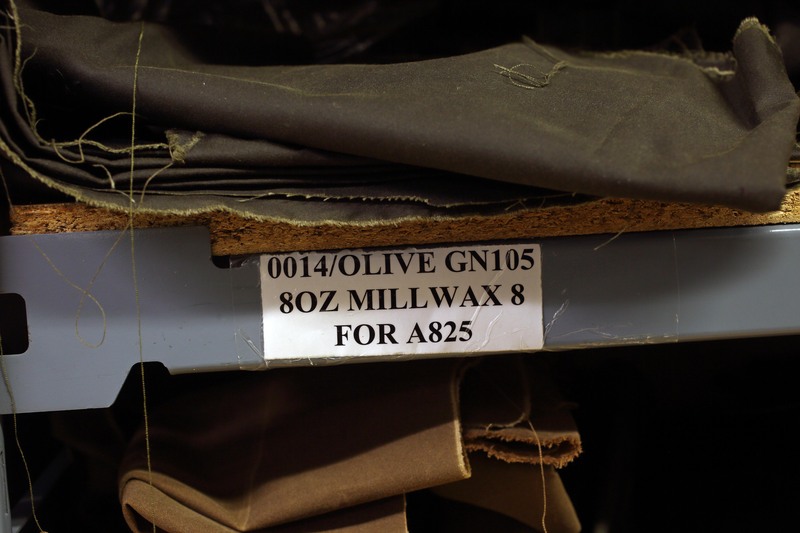 The factory building has five production lines, where seamstresses perform all the steps it takes to make a classic waxed jacket, one after another. The first one assembles the parts of the patch pockets; she then clips the pockets onto a revolving chain, which carries them down to the next worker; she, in turn, stitches those pockets to the jacket fronts. It was the first time I had seen a classic production line like this, and it didn’t exactly enamour me to it. But then if the aim is to produce hundreds of jackets costing £200-£300 each, some efficient mass manufacturing is required. Interestingly, there is no reason a production line should reduce quality (Huntsman used to have one, after all), but it does tend to – often because there is an emphasis on speed. I came alive when we went through a side door into the Customer Services department – repairs, essentially. Here, some of the best and most experienced workers spend their time remaking old jackets. When there is a rip in the wax cloth, a new panel or strip is usually added, so that it runs down to a seam. A small patch, just covering the rip itself, tends to be more fragile. In the photo above, you can see that a black panel has been added to the waist of the jacket on one side, and another at the bottom of a pocket. There is also a small patch covering a hole in the sleeve. 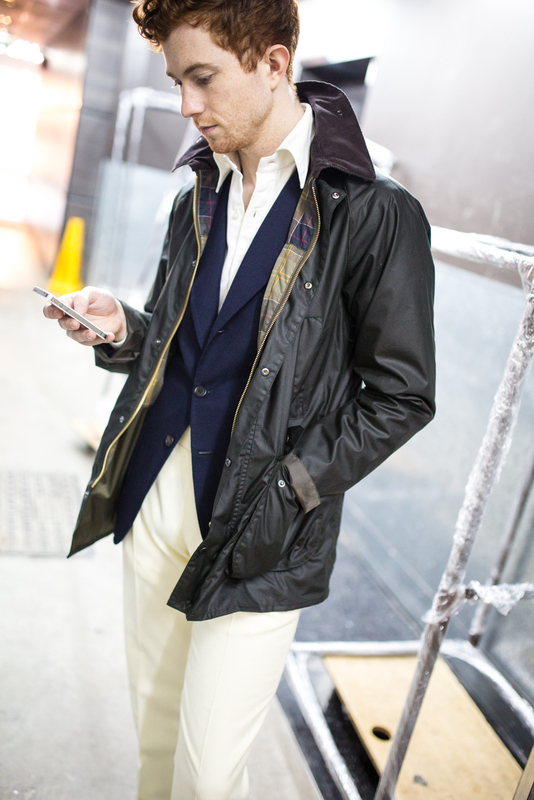 The jacket is immediately even more personal than it was before – remade according to usage. Over time, you can even build up a patchwork of repairs from different points in time. Each patch is the original cloth, but of course the jacket behind it has faded and changed colour with use. One of the biggest issues for Jean, the director of customer services, is finding and storing cloth, linings, buttons and hardware that is no longer made, in order to repair the old garments. As recently as the 1970s, the linings weren’t even uniform to the type of product, so different jackets had different lining patterns. I feel tempted to say that a lot of love is put into repairing the jackets. Certainly if that’s true, it is driven by the love that the owners have for their Barbours. Most repair requests come with a hand-written note, explaining what is required, how it is used, and encouraging care and attention. One jacket (top) was sent in by a woman whose dachshund (Dudley) had eaten parts of it – ripping away the back, the collar and a section of the arm. With the jacket came a photo of Dudley, sitting on a note that said: ‘I’m sorry. But the wax tasted nice!’ The jacket will be replaced rather than repaired, but Jean asked if she could keep the old one for the archive. Repairing the jackets is not cheap. Often, it costs more than the original – which in itself is an interesting reflection of the difference in manufacturing techniques, of a production line vs one-offs. But we all appreciate the beauty of an old, much-loved garment, and waxed cotton ages as well as any. My vintage Barbour motorcycle jacket is a good example, but actually the heavier, green, country jackets are even better. 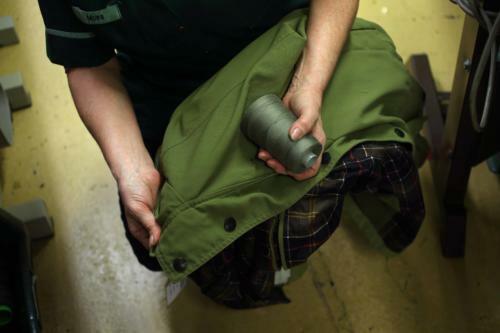 Barbour jackets may not be luxury, but they are highly practical, can be made to last decades (with the help of the repairs service) and can be pretty stylish. Taka at Liverano and Jake at The Armoury (below) being pretty good examples of the latter point. Watch out for the SL cuts of classic jackets, which used to be just found in Asia, but are now generally available. They are usually shorter and slimmer. 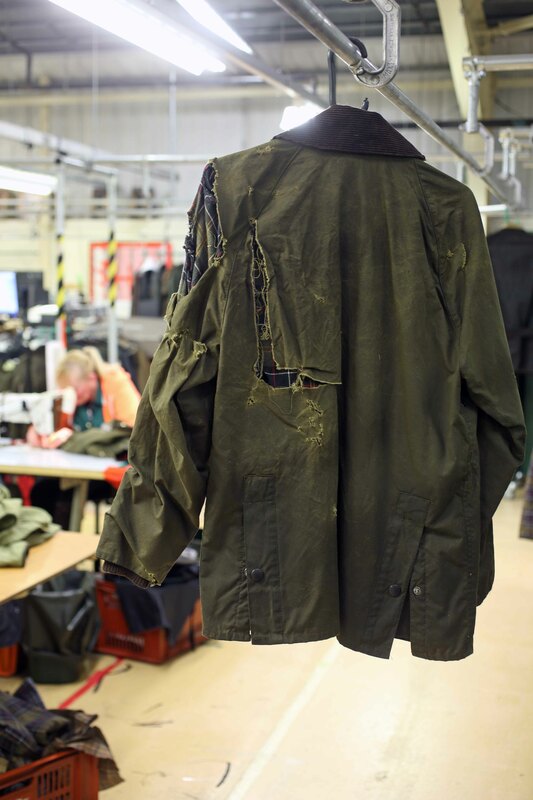 You can follow the discussion on Barbour: Factory and repairs by entering your email address in the box below. You will then receive an email every time a new comment is added. These will also contain a link to a page where you can stop the alerts, and remove all of your related data from the site. Bravo Simon! Garments like this are the antithesis of disposable fashion. Personally, I value integrity more highly than that overused term, ‘luxury’. Any company that does in-house repairs must be making something worth keeping. Made in Britain. Sorry to open with an off-topic question, Simon, but I wonder how you got on with Cleeve of London shirts via Drake’s? Any particular recommendations or insight? Good make, nice casual cloths in particular, and some good attention paid to the collars – recutting and reshaping. Not an Italian make, but with an Italian look at the collar shapes, which are of course the most important thing. I recommend trying them out, and if you like the collars, going MTM for the fit. They’re not doing bespoke now. I was thinking about going MTO as the combination I’m after isn’t available RTW, though I’m unlikely to alter the fit as the detours from their standard block (if that’s correct term) are limited to single ‘longer’ and ‘shorter’ variations, which I imagine would only help those of more interesting dimensions than myself. You can however mismatch the collar and body sizes which, again, may be helpful for some. Absolutely, all about the detail! I like the look with country clothes, not as those Armoury boys wear them over tailored clothing (esp. if the tailoring is bespoke from Livarano with those prices … can just imagine the barbour crunching the bespoke jackets underneath .. oh dear!). I still cant bring myself to wear mine, as I said previously its heavy, even with the lighter weight of cotton as the wax adds a lot of weight to the thing, it doesn’t breathe so you sweat inside it and get sweaty armpits (the stench of the wax is often overpowered by the BO of the fat 50 something bloke you happen to unfortunately sit next to on the tube wearing one over a suit), its not warm in the cold (when it usually is raining). Practically therefore it is quite awful in all respects Simon .. with the exception of perhaps cutting the hedgerow and not wanting normal clothes to get damaged. My beaufort has been sitting in my utility room for a decade or so. How those guys in Asia in that heat and humidity wear them I don’t know, they must have very strong constitutions, a question of style over function I’d imagine. Simon, is waxed cotton really more breathable than modern synthetics used eg for mountain gear? I haven’t seen it tested scientifically, but I would have thought the waterproof/breathable trade-off is somewhat better with the latest Gore-tex or equivalent. I wouldn’t wear waxed cotton for winter sports. In warmer weather, probably no fabric is simultaneously rainproof and not clammy. Except an umbrella. Sadly their “Dept B” which used to customise jackets (extra pockets, longer sleeves, larger collars, etc) no longer operates. It’s just a label attached to some trendy marketing. They do sometimes customise things for big or longstanding clients, but yes it’s no longer standard. Do you have a view of Sykoil v’s traditional waxed cotton? I didn’t realise there was a difference until my Sykoil Beadle arrived recently and whilst soft it’s a shame the traditional smell is lost. I have a Barbour x Jack Spade jacket (shorter and slimmer cut – which I like a lot). Comes with removable vest (adds a touch of warmth). Slightly stiff to begin with but broken in nicely over 2 years now. Enjoy wearing it a lot during transition between Fall/ Winter and Winter/ Spring. Very useful in light/ medium rain and protects from NYC winds. City use (so doubt there will be too many rips) and I can see it lasting many many years. They do make excellent products. thanks Simon, very interesting article. would you have any recommendatons for similar coats but, at the higher end? If you want a similar casual look, Private White for one step up. And Nigel Cabourne (my favourite) for five steps up! Simon…when you mention Cabourn do you mean the Cameraman jacket or others in the range also. Does the quality justify the price? Cameraman is my favourite but lots of others too. The quality is unparalleled, but the very small runs mean the price is very high. Remember, price depends on many things other than quality of make. While we’re on this subject, what about Ten C? Impeccably made and not all pieces are overtly military in character. Hi Simon, great article. Is there any chance to ask them if the Longshore Coat will be available again in the near future? I know it isn’t a stylish piece but as an outdoor garment is unbeatable . I recently had my Beaufort repaired and I can confirm they do a great job. The repairs seem better done than the original. It’s terrific that the company offers this kind of service. Most of the lads who run the shoot I go on practically live in their Barbours and they look great when well worn in and mixed with other textured workwear. Being a North East lad I do hold a soft spot for them, and the lack of fuss in their traditional designs. If you ask me, Barbour is about as luxurious as it gets. Love, quality, details…a beautiful, longlasting product. Good article on Barbour, not least because I live in the North East. 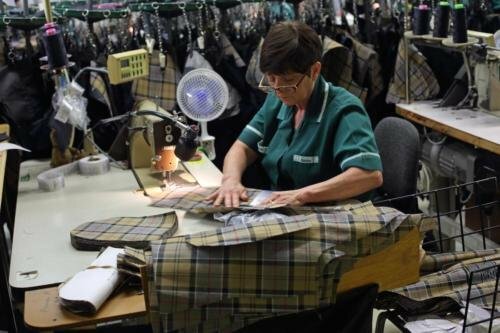 Apart from the Barbour factory in South Shields itself, do you know of anywhere else that will repair/alter them? I have a Barbour-style jacket as such Barbour will not repair it but am looking for someone who does. Perhaps a decent tailor? Any thoughts gratefully received. I wonder if you are able to help. I am looking for a replacement fur hood trim for my Barbour Belton coat. There doesn’t seem to be any accessory replacements available. You’ll have to contact Barbour directly I’m afraid. I had no idea, my 30 year-old needs a bit of love, so thanks for this information!! Unfortunatley this is not the experience I have of the repairs department so far. Thank you for sending your jacket into our Repairs & Reproofing team. Your jacket has been inspected by the team and unfortunately due to the excessive wear and condition of the jacket we are sorry to advise that we are unable to support your request. Very disappointing, I have complained and we’ll see what response I get. Maybe things have changed in 3 years? I’ll state again, my jacket was in no way as bad as that top image. It needed micro tears sewing, lining to be patched in a few places, inner pocket flaps had come away and a 3 inch tear in the sleeve. I’m prepared to pay for it too. I’m now considering a Filson. Just to clarify one point – the top jacket was not going to be repaired, as mentioned in the article. It was too badly damaged for that. 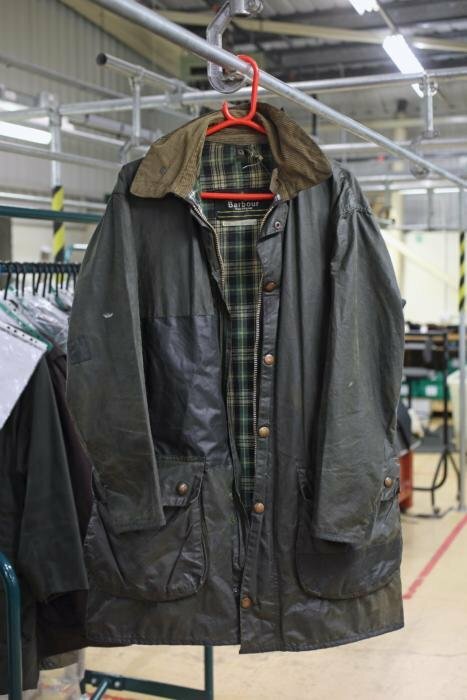 Can fully restore any Barbour Waxed cotton garments, the first picture is not a problem. Blimey. Maybe that is approaching value then!